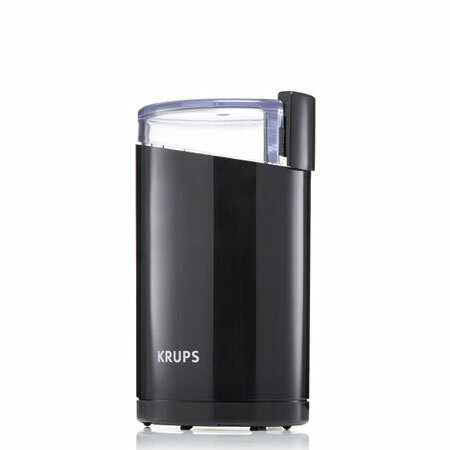 Grind fresh coffee quickly and efficiently with the powerful KRUPS Coffee Grinder, a versatile appliance that can also be used for chopping or grinding nuts, seeds, herbs and spices. 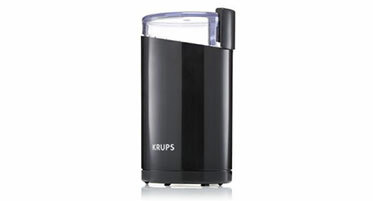 With a compact design and sleek aesthetic, this electric coffee grinder makes a convenient and useful addition to any kitchen. 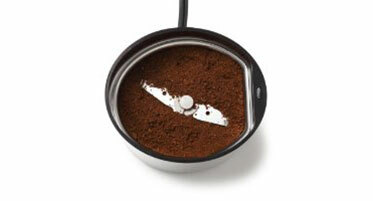 Freshly-ground coffee is a must for any coffee lover. For rich aroma and delicious flavour, the KRUPS Coffee Grinder delivers perfect results with a process that couldn't be easier. Simply add whole beans, secure the lid, and press the side lid button to start. Achieve perfectly-ground coffee in any consistency, from ultra fine to coarse, and taste the difference in your cup: robust, aromatic coffee bursting with flavour. 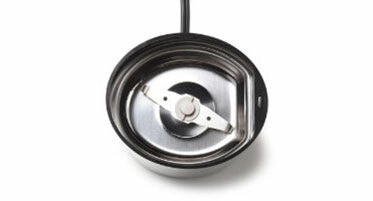 In addition to coffee beans, this versatile and safe grinder can be used for chopping or grinding nuts, seeds, herbs and spices — perfect for everything from summer salads and gourmet entrees to yummy baked goods. 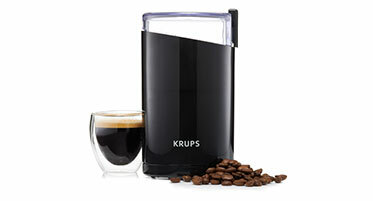 With a compact design and sleek aesthetic, this electric coffee grinder makes a convenient and useful addition to any kitchen. Taking the time to brew freshly-ground coffee from whole beans produces the richest aroma and the most robust, full-bodied taste, for exceptional coffee flavour. Achieve the perfect grind for any desired brewing method through customizing the grinding consistency, from ultra fine to coarse, for perfect results a wide variety of coffee drinks. 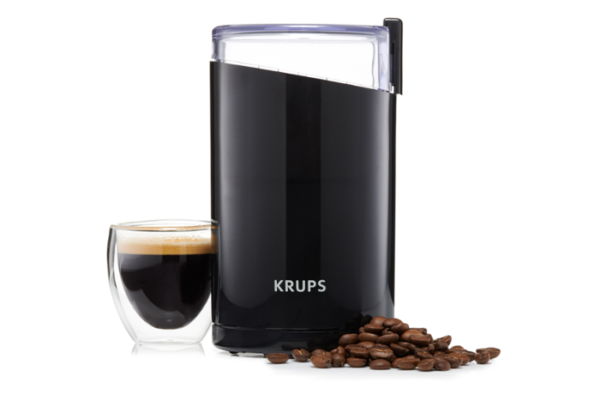 The perfect grinder for any occasion, with a large capacity of up to 3 ounces of beans for up to 12 cups of coffee, ideal for both daily use and while entertaining guests. Outstanding grinding results can be achieved in no time, for even grinding in any consistency through bringing together an oval design with stainless-steel blades. 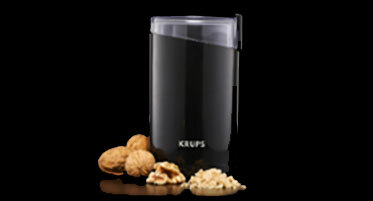 This versatile grinder offers a wide variety of uses beyond coffee grinding, with perfect, full-flavoured results when chopping or grinding nuts, seeds, herbs and spices. As an added safety feature, blades only spin when the lid is securely placed on the grinder, for a process that lets you grind coffee and any other ingredient in full security. We recommend keeping the coffee beans in a cool, dry place. They should be stored in a non-transparent airtight container. Oxygen and damp are the main enemies of coffee, which quickly loses its qualities once it has been ground: damp alters its taste and flavour and the coffee becomes stale and tasteless. 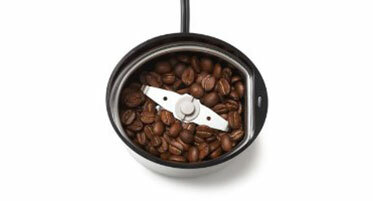 Oxygen oxidizes ground coffee and enhances the bitter taste of the drink; beans should therefore be ground just before making the coffee.